Katherine Tegen Books, 9780062118905, 304pp. This laugh-out-loud novel by Emily Fairlie is a fresh take on the classic mystery caper. It's perfect for fans of From the Mixed-Up Files of Mrs. Basil E. Frankweiler, Chasing Vermeer, The Westing Game, and the Mysterious Benedict Society books. 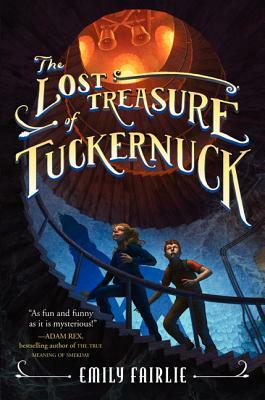 Using a unique blend of notes, lists, and classic prose, The Lost Treasure of Tuckernuck tells the story of Bud and Laurie's quest to find the infamous Tutweiler Treasure. They're hot (or at least lukewarm) on the trail of scavenger hunt clues, but time is running out—the school board wants to tear down Tuckernuck Hall. Can Bud and Laurie find the treasure before it's lost forever? Readers can enjoy solving puzzles along with the characters, and teachers will appreciate references to famous artists and architects such as Pablo Picasso and Frank Lloyd Wright. There is something for everyone in this treasure trove of wry wit, thrilling adventure, and undeniable heart! Emily Fairlie grew up in Virginia and went to Tuckahoe Middle School, which has so far managed to escape the scandals that have plagued Tuckernuck Hall. She has been known to call on her little sister for backup and has witnessed firsthand the horror of bedazzling gone wrong. She now lives in Chicago with her dog, Binky.